The story of John Brogden (1798 – 1869) is of an energetic entrepreneur who progressed from being the son of a Lancashire farmer (who himself progressed from tenant farming to owner-occupancy) via horse breeding, street cleaning contracts in Manchester and London (using a patent machine), constructing and promoting railways, mining and iron production in Staffordshire, Bristol and South Wales, other civil engineering projects at home and abroad (including Holland, Australia, South America and New Zealand) and forming in 1846 a trading partnership with several of his sons that was very successful for several years. All this was achieved without formal training as an engineer although he did receive grammar schooling in Clitheroe. He seems to have had the knack of choosing his workers well and of being well trusted by his backers. Smiles (1872) writes of his energy, drive and daring. Even allowing for Smiles’ Victorian hyperbole, John Brogden’s funding and construction of the Ulverston to Lancaster railway with its difficult route around Morecambe Bay (a project which even the great George Stephenson contemplated but did not proceed with) marks a high point in his career. It enabled his own iron ore to be transported more easily from Barrow and paved the way for Barrow’s prosperity. John Brogden’s is not quite a rags to riches story but it is a remarkable one, never-the-less. John’s death in 1869 preceded the company’s decline in fortunes but the high levels of borrowing to finance expansion began to be problematic when the expected profits from the New Zealand enterprises, the depression in the iron and coal industries and expensive litigation, some within the family itself, took their toll. In fact, cash flow may already have become a problem before John’s death as his will provided for delays in the payments of his daughters’ inheritances for five years. In the event, the younger daughter had to sue the brothers to gain her dues. John’s second son, Alexander (JP; MP) had become company chairman. By 1878 the South Wales interests were in receivership; the company was dissolved in 1880 and two of the sons filed for bankruptcy in 1884. 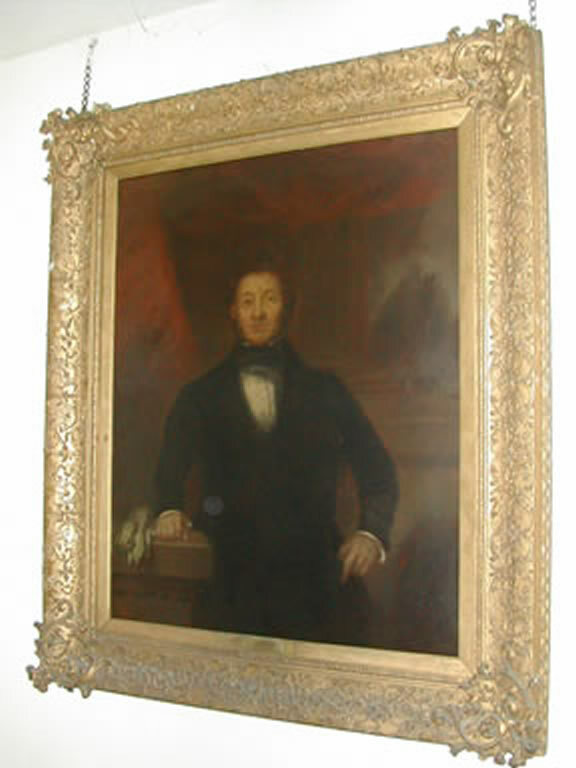 Fourth son James rescued the Brogden’s reputation in South Wales after the bankruptcy by continuing to work with his wife Mary on the development of Porthcawl as a port and town. The Brogdens are remembered fondly in the area, including in street names and the Brogden Hotel. There are also commemorative street names in the Manchester area, such as Brogden Grove in Sale. The fifth son, George, being too young to join the partnership when it was established, later made his own way as a successful civil engineer and colliery owner and was thus not drawn into his brothers’ downfall. John Brogden had seven grandchildren and four of these were males to carry the surname forward. It has not yet proved possible to find any male great-grandchildren. Grandson *Arthur John seems to have had no children; James had a daughter, Edith; **Duncan Dunbar, who spent a few years in the army in India and died relatively young, was married but his wife died in childbirth, as did the baby; George Alexander who became a family doctor in Southampton married Grace Elizabeth but it is not known if they had any children. For the moment, it would appear that the branch of the Brogdens that produced John Brogden and his enterprising sons, had run out of male heirs by the end of the 1930s. Of the female lines, little is currently known, other than through the descendants of Samuel Budgett who married John Brogden’s elder daughter, Sarah Hannah. His agreement to act as a trustee to John Brogden’s will brought him financial disaster. His descendant, David A Budgett and David’s cousin, Robin E Brogden Budgett, have maintained a strong interest in the John Brogden history. Currently under preparation and awaiting archeological exploration (and thus only open at present to pre-arraged visitors) is PARC TONDU, where John Brogden's ironworks near Porthcawl in South Wales can be seen. The lift, engine houses, coke ovens, kilns, blast stoves and furnaces, rolling mills and offices are available to view as part of a guided tour. It is planned for the site to be fully open to visitors. Parc Tondu is a Scheduled Ancient Monument. Phone 01656 727810 or email tonduironworks@groundworkbnpt.com to arrange a visit. * The 1881 Census lists Arthur John as a landowner, living at 13 Hereford Square, London with his wife and three staff. Tom Metcalfe's memoire says that “After the “great loss of money, Arthur took to the church.” Alumni Cantabrigienses notes that he was ordained Deacon in 1883 and Priest in 1884 at the church of St Barnabas, Cambridge. He died a year later, aged only 31. The Furness Masons website (www.FurnessMasons.org) describes Arthur John as a founder member of the Grange-over-Sands Lodge which is named after him and where hangs a portrait donated by a fellow mason in 1916. He had been a mason whilst at Cambridge. Arthur John nominated his uncle, Alexander, to be a member in 1877. Alexander resigned in 1879 and Arthur John in 1882. It is not known if Arthur John had any children. Click here to see the photo. Many thanks to John Martin for calling attention to the link with the Masons and for supplying the photograph and to the Lodge Committee for their permission to add the photo to this website. 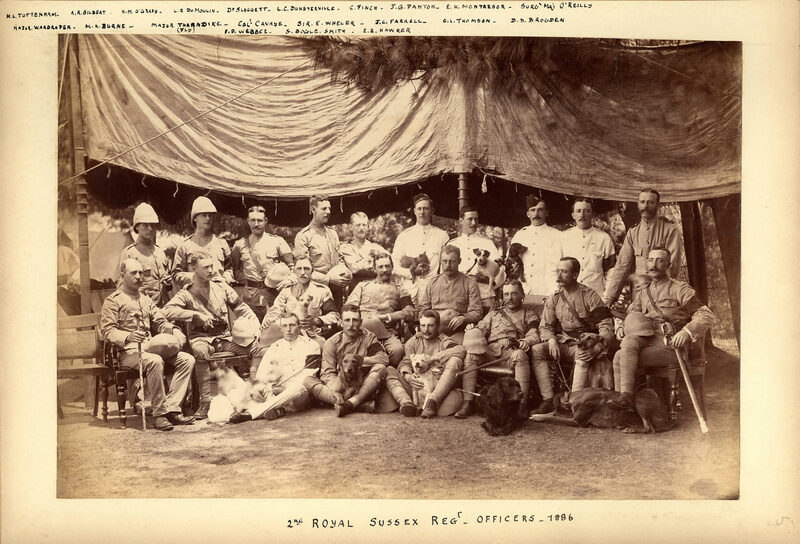 A photo of Duncan Dunbar Brogden, taken in 1886 with a group of fellow officers of the 2nd Royal Sussex Regiment, possibly in India. This photo is reproduced by kind permission of the County Archivist, West Sussex Record Office (Ref: RSR PH 2/10). Our study of the Brogdens began with the Oxfordshire Brogdens and their descendents. The big, unanswered question is whether they were direct migrants from Yorkshire where the name originated or whether the Oxfordshire Brogdens have a different ancestry. Much further work needs to be done to trace the name before it appears in the Bampton, Oxfordshire, church records in 1709 and the Stanton Harcourt, Oxfordshire, church records in 1710. The Stanton Harcourt registers refer to a George Brog(den)'s death in 1740. Perhaps it was the same George who married Elizabeth Brown in Bampton on 1 October 1709. This George is the first recorded Brogden to be found in Oxfordshire (so far) - assuming George Brog was a Brogden. Did his parents live in the area or did he move here, perhaps at the time of his marriage? The Stanton Harcourt church records go back to 1566 but the first mention of George is the birth of a daughter, Mary, in 1710. It is not clear whether the George who died in 1740 was the father or the son who was born in 1719. The records do not tell us. Another question is raised by the record that Elizabeth Brogden ("wife of George") died in 1718. Elizabeth Brown married George the elder in 1709 so this is most likely the Elizabeth who died in 1718 - but, if this is the case, who was the mother of George the younger (1719), Richard (born 1721 and from whom all subsequent Oxfordshire Brogdens seem to descend, Hannah (1723) and Benjamin (1726)? We do know that George was a blacksmith, a trade that would have been much in demand on the Stanton Harcourt estate, but where was he employed? Several hundred Brogden descendents of George have been found, not only in records in Oxfordshire and neighbouring counties in England but also in New Zealand, Australia and the USA. One theory is that George came from neighbouring Warwickshire where Brogdens are found in various records that pre-date the Oxfordshire Brogden records - see, for example, the information on Edward Brogden in this website, who was a Member of Parliament in the 1550s. A discovery in the Warwickshire County Record Office database (see www.a2a.pro.gov.uk) is that a John Brogden of Hampton Lucy, Warwickshire, received a quitclaim (renunciation of any claim against a right to land) from Thomas Denton of Besselsleigh on 28 March 1547. Besselsleigh was then in Berkshire but now in Oxfordshire and is close to the area in which the Oxfordshire Brogdens flourished. This may be a simple co-incidence but Warwickshire borders Oxfordshire and there are other intriguing references in the database to Brogdens in the Warwickshire area: Thomas Brogden, a draper, in Stratford-upon-Avon in 1574; Sir John Brogden, minister, who won a dispute with King Henry VIII during the dissolution of the monasteries and had property reinstated; Edward Brogden, "gent" (of Worcester, who may be related to the MP mentioned above) in 1547. A visit to the Warwickshire and Worcester record offices is called for. Brogden was (and continues to be) a rural place name, near Barnoldswick, in the old West Riding of Yorkshire, England. It is now in the county of Lancashire. The Oxford Dictionary of Place Names (Ekwall; 1966) lists Brogden and its first documented mention as Brokden (1307 in the Pudsay Deeds). Brogden = brook dene = the valley of the brook. Queries frequently arrive from Brogdens worldwide whose ancestors came from Yorkshire. It is usually the case that links between these Brogdens cannot yet be made. Over the years, many Brogdens migrated from Yorkshire to neighbouring Lancashire and census and other records show large numbers right up to the present day. As with Yorkshire, queries frequently arrive from Brogdens worldwide whose ancestors came from Lancashire and it is usually the case that links between these Brogdens cannot yet be made. Much work needs to be done on these researches. Recently Tony Brogden retired from an Estate Agency which carries his name in Lincoln. His relative, Anne Brogden, who lives in Liverpool has researched her branch of the Lincolnshire Brogdens and concludes that they came from London in the early 1800s. One, Thomas John Nathaniel Brogden was twice mayor of Lincoln. Anne's grandfather, John Ellet Brogden (1837 - 1875) produced a fanciful family history by combining various unrelated Brogdens from several sources, including James Brogden the MP (see elsewhere in this website) and another James, the infamous vicar of Deddington, Oxfordshire (to be found in the Oxfordshire section). Many of the New Zealand Brogdens are related to emigrants from Oxfordshire but others came from various places in the UK. See the Oxfordshire Brogdens Family Tree for NZ connections. The railway contractor, John Brogden & Sons, built some railways in New Zealand but lost money in the process. His efforts to ship railway labourers to NZ are described in "The Brogden Navvies" in the links below. Link to "The Farthest Promised Land"
For a website transcript of Rollo Arnold's book, "The Farthest Promised Land - English villagers, New Zealand Immigrants of the 1870s" published in 1981 and now out of print, click on the link below. This book has the chapter on the Brogden Navvies which is summarised in the article above (see John Brogden and Sons of Manchester). Rollo Arnold also includes a reference to John Bragden, an immigrant to NZ from Oxfordshire. This is in fact John Brogden, a member of the Oxfordshire branch and not directly related to John Brogden of Manchester. There were no Brogdens on the Mayflower but plenty of Brogdens from various parts of England found their way to America on other ships. Most of the Brogden contacts in the USA have been unable to trace records of the arrival of their ancestors but some are able to pinpoint their roots in England. Some spell the name with DEN and about as many use DON. The Oxfordshire Brogdens' family tree shows several links with Australia, both because of direct migration and of migration from New Zealand. Neil Brogden of Ballarat has traced his ancestors back to John who was born in Barwick-in-Elmet, Yorkshire, in 1792. His son, John Thomas, born in 1830, went to Australia in 1848. A branch of the Brogdens went to Canada from Sabden in Lancashire. It has not yet been possible to identify them positively but it seems likely that they descend from James Brogden who was recorded as a householder of Brogden Farm, Sabden in 1828. A photograph of Brogden Farm from the early 1900s appears in this website. (See Places and Maps) For the moment, it is assumed that Brogden Farm got its name from the Brogdens who lived there. A Canadian descendant hopes to collect more information. Two or three other Canadian Brogdens made contact in 2003/4 but so far, there are no documented links between them. Stephanie Brogden traces her ancestors to Eward from Yorkshire. Christine Cross has Brogden ancestors. Geoff Brogden's father went to Canada in 1906. Once upon a time, long long ago, in a land far far away (from me, but not from you) a boy was born. (I think it was 1826 - this is based on him being 55 in the 1881 census) in Sabden, Lancashire. I have another date of birth for him as being November 5, 1835. Sometime before 1870, he immigrated to Canada (Ontario) where he worked as a brewer and was a member of the Masons. This is in Galt, Ontario. He then married (again before 1870) a Jean Duncan, somewhere in Ontario. He is listed as living in Brantford, Ontario in a director for 1865/66. On October 18, 1870, they had a son, Samuel Stirling Brogden (family story is that the middle name was Stirling because that's where Mum's family was from). The 1881 census tells us that the James (who was a brewer in Galt) had a son Samuel, aged 12, so this all makes sense so far. Other children of this marriage included Eva (born 1872 - who married a Mr. Norman Burnett of Red Deer, Alberta), Mabel (born 1878 - who married a Mr. D.P. McColl (or McCall) of Red Deer and who was a teacher in 1902 in Calgary, Alberta), Dora (born after May 1891 who married a Mr. Alex Hume), Lydia (a.k.a. Lil - born after 1891) who married a Mr. Bangs and lived in California, John (born after 1891), and Harry (born after 1891). At some point, the Brogden family or portions of it, came out and homesteaded in the Calgary area. The nearest town is Midnapore, which is now part of Calgary. James was a member of the Masons here as well. Samuel married a Maud Dames, a nurse, on November 6, 1901. Maud's birthday was August 17, 1870 and she was born in Ontario. There were four children of this marriage. Jean Stirling Brogden (Born August 27, 1903 - my paternal grandmother), John Brogden, Jeffrey Stirling Brogden (who died when very young) and Harry Bertram Brogden. James eventually moved to California to live with his daugher (Mrs Bangs) and died there on June 5, 1930. There are Brogdens recorded in the area from as early as 1687 when Richard Brogden was an Alderman of Norwich. There are a lot of Brogdens to research in the London area. Of those on whom we have some information, some went to London to be servants; some ran businesses (see Brogden Artists, Performers, Businesses & Products); a couple lived there as Members of Parliament; one family moved from London to Lincolnshire (see above); one inherited all of a famous Bishop's tenancies.